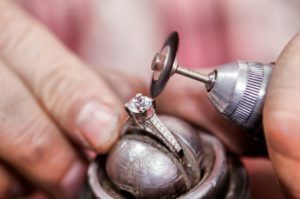 Federal Way Custom Jewelers has offered expert repair services to our clients for over 50 years. We have a team of amazing gold and silversmiths that take the time to repair your jewelry, from a simple solder on a broken chain to replacing the head of your mother’s diamond solitaire, these metal workers are truly masters of their craft with impeccable reputations. We specialize in fine jewelry repair on platinum and gold, but occasionally work with silver. Unlike many jewelers who repair a piece, and then charge you when their repair doesn't last, we guarantee almost all of our repairs for ONE YEAR. While this is a rare occurrence, if there are any problems with your repair, we will fix it for no additional charge until it exceeds your expectations. Frequently we see our pieces 20 years after they were made, still in perfect condition due to the quality of our gold work. Jewelry repair is an art that takes time to be done correctly. We ask between three and five days to return your piece depending on the intricacy of the repair. Goldsmiths are artists who want to repair and restore your jewelry to its original condition, and while rush jobs may become necessary, we take time to do our work well. When you bring your piece in to our store, we will look at it WITH YOU under the microscope to determine the extent of any damage and wear, and show you what ought to be fixed. This will also inform you first hand of the features unique to your gems and jewelry for your peace of mind. This allows us to fully describe the piece and the repair before the work is done, and a claim slip will be given to you noting the features of your piece. If you are unsure what your piece needs, bring it to us for an expert opinion. On rare occasions, the piece will be sent to the goldsmith for an estimate before the work is completed. All of the below repairs can be done in gold, silver, platinum and palladium. soldering broken items: chains, bracelets, ring shanks, etc.